As you’ve heard, the US government is reporting an increase in terrorist “chatter” as the 12th anniversary of the WTC attacks of 9/11/01 approaches. This year marks the first Jupiter Return to the 9/11 horoscope for Jupiter’s cycle is 12 years in duration. See Threats Against Embassies Very Reminiscent of Pre-9/11 Chatter. On the morning of September 11, 2001 at 8:46 am edt NYC, monied Jupiter was posited in 9th house of Foreign Lands and Philosophy @11Can35 and carried the Sabian Symbol, “A Chinese Woman Nursing a Baby with a Message”, a word picture I attempted to illustrate a few moons ago. View the image here if you wish. Naturally the symbol’s reference to our creditor China and to a ‘message’ is intriguing especially since it attaches to 9/11’s position of Jupiter the Banker–in the 9th house of foreigners. This is not to leave out Middle Eastern or other actors on 9/11/01 but to focus on Jupiter since the Great Benefactor now returns to the natal position he held on that game-changing morning. Actually, Jupiter’s retrograde in Cancer later this year creates a “three-fer” of returns to the 9/11 natal degree with the first return occurring on August 18, 2013, the second on February 7, 2014 (Rx), and the last return on April 2, 2014. This extended return period indicates a prolonged season of concerns involving terrorism with increased threat levels on into 2014, and it has Jupiterian financial implications as well though effects may be of a stop-go nature. Raising the threat level makes sense and yet…will the “more chatter” situation be used in an attempt to justify intrusive NSA surveillance programs and leave them as they stand–even those used against the privacy of the American (and other) people who have nothing at all to do with terrorism? If we begin to hear politicians and pundits spouting such equivocations, perhaps we’ll be pardoned for having our suspicions if any attack/s occur–or are thwarted–by America’s total surveillance prowess. distrust of the US government is also at high levels (or depths!) and this may cause any violent attacks relating to 9/11/01 or otherwise appear as much like a false flag op as the original event still seems to many who doubt the ‘official version’ of 9/11/01. Another consideration with astrological Jupiter is that he expands and increases whatever he contacts or is involved with–positively or negatively–and the added challenge of transit Pluto in Capricorn opposing 9/11’s Jupiter (and the two planets combined = big bankers, influential politicians, those who mount large-scale projects, and/or powerful religious leaders)–and US natal Jupiter (5Can56)–denotes limiting conditions, commercial and/or trading difficulties, and a potential for travel interruptions occurring off and on. Also, Jupiter loves freedom as does Uranus and right now, transit Uranus @12Ari07 Rx (a critical-crisis degree) squares (90 degr) 9/11’s Jupiter denoting rebelliousness against restrictions (one signature of Gitmo and other prison breaks, plus, political cat-herding in Washington), dissatisfaction with political views in or of society, and a distinct potential for erratic or misplaced generosity. Add in the fact that transit Saturn now in early Scorpio (sign of Big Business, debt, surveillance, the occult, death and regeneration, transformation, betrayal, etc) will soon enter the 2nd house of Earning Ability and the National Treasury in the 9/11/01 horoscope–and eventually visit 9/11’s Pluto (@12Sag38, America’s natal Ascendant in the ‘Sibly’ chart) which happens to conjoin 9/11’s 3rd cusp of Communications and Short Trips. This transit denotes a time of power issues and the loss of control over situations which were just too big to begin with. To me, Saturn-to-Pluto conjunct US natal ASC sounds rather like the gargantuan and rights-abusing US surveillance system with its frilly underpants recently yanked down a mite by former NSA employee Edward Snowden…that, and our corrupt-to-the-core financial system of Too Big To Fail banks, plus, the highly rigged casino we call, Wall Street. Now isn’t wearing saggy pants now illegal in some states? Oh, and one more thing: 9/11’s 2nd cusp mentioned above has an appropriate Sabian Symbol when its degree (11Sco28) is rounded up to ’12Sco”: “An Embassy Ball”. Perhaps you’ve heard of what promises to be a lovely cosmic display at dawn on Tuesday November 27, 2012 as Venus and Saturn rendevous in the heavens. Plus, click for info on the tango of Venus-Saturn-Sun occurring on December 21, 2012 that ties in with the often-touted, much-heralded Winter Solstice 2012 which times a very rare galactic alignment. Naturally, I had to check a Tropical horoscope to find the degree that Venus and Saturn meet at dawn on November 27th so that we may consider its *Sabian Symbol (word picture) for a few evolutionary details. Setting the chart for the White House (should old habits be forgot? ), Venus clocks in at 6 Scorpio 44 at dawn while slower Saturn has reached 6Sco14 in the Zodiac. Actually their astrological conjunction will be exact on November 26, 2012 at 8:19 pm est @ 6Sco11:07 during the Mercury Station Direct @ 18Sco10:13 which will occur 2 hours 31 minutes prior to the Venus-Saturn conjunction. As you know, ‘voting’ Mercury turned Rx on Election Day 2012 and we’ve seen several states with contested outcomes and recounts which should be completely settled very soon with Mercury moving forward. “Thesis: Restrictions on wealth or income; law enforcement avoiding difficult or cumbersome issues; changes forced on enterprise by new social, artistic, or musical values; building the value of the enterprise. Hmmm…let’s not get onto the level of the “fiscal cliff” or tax cuts expiring debate in Washington DC in this brief post but the above potential does makes me wonder if the Venus-Saturn rendevous has anything to do with current workers’ strikes in the US and the upper management that will most probably clamp down on them. Ex: protests continue with Wal-Mart workers intent on striking on Black Friday, the beginning of the Christmas shopping season in the US. Seems to me our ‘survival of the fittest’ society already has way too many of those of a Social Darwinian mindset with ‘fundamentally unsocial instincts” toward their fellow man! So, on that rather grumpious note, I’ll close with a Happy Thanksgiving to any and all in the US! And yes, let’s remember our displaced Hurricane Sandy victims by contributing if and all we can. Did you know that Staten Island’s Dr. Atlas Foundation is a great way to donate? Here’s a link to the organization’s Twitter feed. Saturn’s tough medicine is on the way for our nation! And it’s the planetary ruler of Government, Law, and Business. ‘Sibly’ Midheaven (*00Lib53) of Public Status and Career. The opposite cusp, the IC 00Ari00 is also affected, of course, and relates to the Domestic Scene, Security, Real Estate, and our Psychological comfort. These Cardinal Points – 00Ari/Lib and 00Can/Cap are World Points where big events tend to manifest – but that’s not my focus here. Saturn to natal Midheaven should be a time when one receives what one deserves concerning recognition, success, and increased status in the world. Yet what is gained with Saturn-to-MC is most often accompanied by an increase or deepening of responsibilities but all works out well if one – or a nation – has taken its responsibilities seriously in the past. Mistakes of this nature may well come into view with this transit for the 10th house cusp (MC) is the most prominent and visible point in any horoscope. Saturn/Pluto = Mercury: depression; stark realism. Sun/Jupiter = Pluto: pursuit of fortune/acquiring wealth; success; fulfillment in a big way. Mercury/Jupiter = Pluto: dramatic persuasion; the big proposal. Uranus/NN = Neptune: being deceived by others; meeting with people off the beaten path; the undermining of associations; retirement of a partner from a joint venture; one who is easily impressed or influenced. Pluto/ASC = Saturn: oppressive dealings with others; difficulties and losses; forcible suppression; using coercive measures with others. Pluto/ASC = n MC: attainment of power and authority; career success; ego ascendancy. In Mundane (Political) Astrology, as you know, Saturn on one level represents the Democratic Party and Pluto signifies many things: secret controllers, extremely wealthy people, the Dragon guarding the riches, spies, assassins, coping ability…the list goes on. And since Mirzam is rising here (see the Star’s keywords above) we may say that Pluto’s ‘say’ is suppressing the Dems forcibly – on one level. If the ancient Exaltation factor in Astrology has anything to do with it, perhaps Saturn’s Exaltation in Libra will see us through what promises to be a difficult transit for America who has not always honored Saturn’s lessons. This transit may be fraught with learning (Saturn) to do just that – ‘the hard way’ which is Saturn’s way of doing things. The fact that’s it’s drawn out into the second half of 2010 indicates our difficulties – and our government’s difficulties – in learning from our past mistakes and accepting the blame where it belongs – in Washington, Wall Street – and Main Street. Hopefully on or soon after conjunction #3, things will find resolution concerning these issues. One thing an astrologer usually does with any transit is to look back to the last time it occurred for clues of its nature which in the case of Saturn-to-US-n-MC was only once, on Sept 28, 1980, the year of the campaign that installed Ronald Reagan in the White House. All these words are Saturnian! Let’s hope with the repeated transit for 2009/10 that President Obama heeds well Saturn’s call and honors our Exalted national Saturn in Libra, sign of balance. Yes, I have definitely ‘FlashForward’ed on the 12 North Eclipse which won’t manifest until Jan 15, 2010, but we may as well consider it ahead of time. Sun/Moon = Pluto: biased attitudes or changed circumstances lead to critical phases of development or to separation from others; a soul torn by inner conflict; potential new perspectives in relationships; separation to start anew. Then there’s the practical Earth-Earth Sun Cap-Moon Cap blend to think about with its clearheaded ways, so why not? We could use some o’that, couldn’t we? The Cap-Cap combo is realistic and responsible; autocratic yet pragmatic; ambitious, serious, conscientious, self-controlled and sophisticated, yet may tend toward fearfulness. There is a deep need for security and authority, and one finds a way to make certain one is immune to attack. Organizational talents, a resourceful intellect, and a love of material acquisition are often in evidence; there is a protective streak, especially toward loved ones, and a dislike of appearing weak or incompetent. Spoken like a realistic Capricorn! “Seventh birthday” is around the time we all experience our first Saturn-square-Saturn – and Saturn rules Capricorn, sign of the Old Man (senex); one of Cap’s body parts is the knee. So there we go. But does the grandson appreciate the significance of the rare gift? I suspect he will when he’s older, don’t you? After he has tucked a little ‘progress’, experience, and knowledge under his belt buckle. 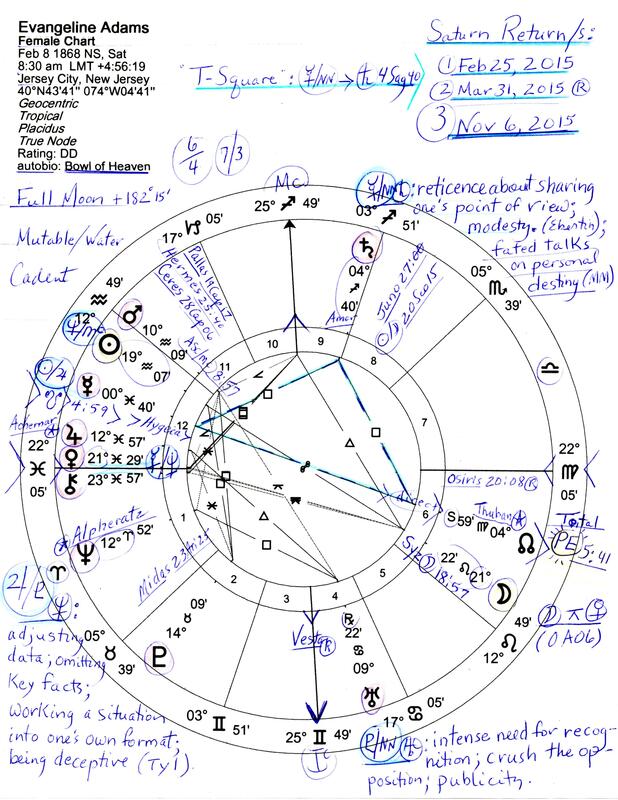 Well, if you wish to read my freshly published notes with chart image included (chart set for Washington, DC), click here and check out the 12 North Solar Eclipse which last manifested on Jan 4, 1992…and you may feel some Health Care (Insurance) Reform coming on…or perhaps it’s only a head cold. Update 1.15.10: here’s a chart image of today’s Solar Eclipse splashed around the natal chart of the Pentagon, details included. Psychologist Carl Jung was born July 26, 1875 in Kesswil, Switzerland, 6:52 pm; Asc 00AQ54; Mc 28Sco47. Sun 3Leo19, Moon 15Tau29 nearing conjunction with Pluto, planet of psychoanalysis. Sun is conjunct ‘dedicated’ asteroid Vesta. Jung’s Fire-Earth blend of Sun Leo-Moon Taurus has these Images for Integration, a possibility he would have approved of, especially since the brilliant Dr. Jung studied the Astrology charts of his patience for better understanding! And here’s a note on Old King Cole who was an early Celtic chieftan of the British Isles and from what I can find, was left in charge when the Romans appropriated the place. Actually, there seems to have been three of them – father, son, grandson, and all may have been rulers. The current day Coil, Cole, Coel, Coal, Coile, Coyles, Kyle, Kile families may be descendants of his ancient clan. The above ditty uses ‘wife’ yet I’m more accustomed to ‘he called for his pipe and he called for his bowl’ . In Britain there remain the towns of Coilsfield and Coylton which bear his ancient name and this particular ‘Cowell’ would like to visit there sometime! Interestingly one of Old King Cole’s symbols of authority is the Caprington horn (photo below) which brings in the root word for Capricorn, the sign ruled by Old King Saturn. And yes, I have four planets in Capricorn: Sun, Jupiter, Mercury, and Mars…and that’s plenty of Saturn for a Saturnian astrologer, don’t you think?! Former aides to George Bush are telling a few tales and explaining his sorry presidential performances. The re-writing of Bush-Cheney-maul-the-White-House has begun, but this article loosens the lid on the ususal spin thanks to former aides sharing their perspectives on the Bush presidency. Well, astrologically, Hurricane Katrina at the end of August, 2005, was Bush’s Saturn-to-natal-Ascendant transit, one of the more important transits which comes around approximately every 30 years – for everyone. Now 30 years of life is time enough for most people to ‘get it’ in the Saturn department – responsibility, accountability, authority issues, that sort of thing. He was 59 years old then – did George Bush get it by August 2005 ? Saturn to Ascendant is a period of time when we are forced to face ourselves honestly, the more honestly the better. And being the Ascendant, self-image and how others view us are in for change – plus, something karmic may come along to up the stakes as past actions are revealed for what they really are. Kind of a second chance for Bush to ‘be’ Saturn – the authority with clout, the one who accepts the buck when it stops at his desk – in his case, a presidential desk. This is a ‘moment of truth’ transit and the entire nation – indeed, the whole world – saw in stark relief how little Bush valued fellow citizens’ lives and property. They also saw how governmental offices that had worked admirably before were diverted by the Bush administration into keystone-cop-chaos. To my eyes in 2005, it seemed that if class warfare were ever going to be noticed by the previously unaware, this would be the time, and in that department Bush did not disappoint – his racism was obvious, imo. The haves vs the have-nots in need, and George bailed and failed. Bush’s complicity in undermining the social fabric of America by letting down the people of the Gulf Coast unto death, and his dismantling of our government was on-view during Katrina – we remember that Bush-Cheney insisted that FEMA be absorbed by Homeland Security Dept…absorbed and ruined in time for Katrina. Perhaps Ronald Reagan, their touchstone, would have been proud. Newt Gingrich may have been impressed as the ‘Contract Against America’ played out. But few others were proud or impressed with Mr. Bush’s performance. Saturn to Ascendant brings more responsibilities along and a chance to step up as events require that personal attention be paid. Meanwhile, Bush was celebrating John McCain’s birthday by cutting the cake as the people of New Orleans drowned and the nation and world looked on in horror. Saturn brings high rewards for correct actions and this transit is no exception – it embodies the higher lessons that Saturn insists we face in our lives – even George Bush with his natal 12th house Saturn in self-protective Cancer. So he’d had a Saturn Return in summer 2005 indicating similar Saturnian themes. Saturn in 12th house is led to believe no responsibility is required, and being a Water house, the 12th house of the Unconscious and Karma tells the tale here of a weakened Saturn in need of many lessons. But it is the nation paying for them. And while Saturn to Ascendant can result in an impressive display of maturity and finesse, it’s safe to say that George Bush at Katrina time was AWOL just as he’s been before…and Saturn doesn’t like to be disappointed and let down like an old man (Saturn) left to drown in an attic or miserably stranded on a rooftop with no help in sight – while the fatcats play and wink. Yes, Katrina highlighted Bush’s lack of compassion and showed where his heart would be if he had one for anyone but himself. Makes me want to throw an umbrella at his head if I’m ever unfortunate enough to see him pontificating from a podium about tacos or freedom.